It was lovely to be back with Writers Without Borders today having missed 2 meetings. 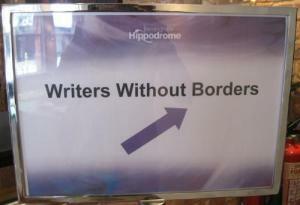 Surprised and pleased that the Hippodrome has given us our very own sign so guests no longer have to guess where we are. I shared a piece I wrote in 2010 ‘Caribbean Cowboy’, but have never read in public. I was extremely pleased with the way it was received. It is such an affirming group! Loved hearing everyone else’s pieces too. Felt like I was back with family.